The biggest product news in Mayberry this issue is actually about something that probably won't be on our shelves at Weaver's, but only because of the logistics involved. Whether it's on our shelves or not, we're sure that Mayberry fans everywhere will be eating it up. Call Goober and the Darling family. Break out the Blue Willow and the checkered tablecloths! Aunt Bee is back in the kitchen in Mayberry, and she's cooking up some down-home, delicious dishes that will soon be ready for you to bring home from your favorite grocery store. That's right. America's beloved hometown cook and the folks at Diversity Brands are teaming up to create an exciting new line of packaged foods that will bring the flavors of Mayberry right into homes all across America, and beyond. The new line of foods is called Mayberry's Finest and it's being introduced to America at the Food Marketing Institute Show in Chicago, May 6 to 8, and will then stroll onto store shelves in late summer. Among the millions of us still avidly tuning into Mayberry is Phil Connelly, president of Choice Food of America, a partner in Diversity Brands. Phil adds, "While we're focused on providing only the very best foods, we also plan for the appeal of the packaging and promotion to be a reflection of the wholesome entertainment and fun of the show itself." "We're thrilled to have an association with ‘The Andy Griffith Show,' and to have this wonderful opportunity to create some delicious premium foods that also connect with the fond memories and deep affection that millions of people have for Mayberry and what "The Andy Griffith Show" stands for," says Marcela Gómez, president of Diversity Brands. Marcela and Phil both conveniently dodge questions from us about how Mayberry's Finest plans to deal with the only two foods that Aunt Bee doesn't know how to prepare: homemade "kerosene cucumbers" and marmalade. All Phil will say is, "Wait and see. Wait and see." And while it doesn't take a keen investigative mind like Barney's to predict that the companies involved with creating Mayberry's Finest would be enthusiastic about the new line of foods, what is the reaction on Main Street in Mayberry-that is, among the show's many devoted fans? For the answer to that question, no one is in a better position to know than Kenneth Junkin, leader of TAGSRWC's "Hearty Eatin' Men and Beautiful, Delicate Women" chapter (Tuscaloosa, Ala.) and one of the biggest fans of TAGS. But that's just the sort of effect that the news about Mayberry's Finest is having on people. Mayberry's Finest will be featured in the Diversity Brands booth at the Food Marketing Institute Trade Show at McCormick Place in Chicago, May 6 to 8. Along with information about the new Mayberry Finest line of packaged foods, the booth will host three of Mayberry's finest-Darling cast members Maggie Peterson Mancuso, Doug Dillard and Rodney Dillard. The booth will also feature a full-size replica of the Mayberry squad car. 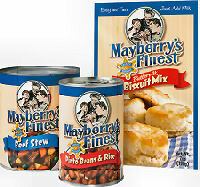 We could say a lot more about the Mayberry's Finest line of packaged foods, but as Andy Taylor and Briscoe Darling both once told Aunt Bee, "Eatin' speaks louder than words." We'll follow their lead and leave it at that for now. But be sure to check out their Web site at www.mayberrysfinest.com. It'll be active in a few days, and will be updated regularly as products and fan-oriented promotions begin to reach stores later in the summer. 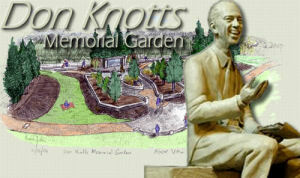 The Don Knotts Legacy Fund, established by the Greater Morgantown (W.V.) Community Trust, is going to create a Memorial Park that will include a welcoming statue of Don sitting on a bench. Don's family has given wholehearted approval for this effort, which should be a wonderful tribute to Don and his memory. The proceeds from the sale of these autographed photos are being split evenly among the Legacy Fund, the American Lung Association and the Surry Arts Council (in support of Mayberry Days), all in memory of Don. We encourage folks to make donations directly to the Legacy Fund, if they wish to offer further support for the creation of the Memorial Park effort. The Morgantown Legacy Fund should provide a beautiful and lasting tribute in his hometown. The Knotts family also has donated some of Don's scripts, his only original poem and other special items to his alma mater in Morgantown, West Virginia University, and to other collections. Don also had donated some items to the university before his death. Mount Airy's Emmett Forrest received a special package from Francey Knotts, widow of Don Knotts, with several new pieces for his Andy Griffith Memorabilia Collection. "I'm honored that Mrs. Knotts chose our Collection to be the permanent home for these special items," Emmett said. "I'm proud to accept them on behalf of our community. They are tremendous additions to our existing Collection. I think they will be of great interest to fans of Mr. Knotts and Mayberry." 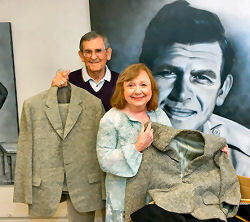 A PAIR OF SUITS IMPRESSES PAIR-Emmett Forrest and Betty Lynn pose with the two salt-and-pepper suits donated by Francey Knotts to Emmett's memorabilia collection in Mount Airy. One of the salt-and-pepper suits was worn by Don on "The Andy Griffith Show" and in The Ghost and Mr. Chicken, among other occasions. Current information is that he wore the other suit in the 1986 reunion movie Return to Mayberry and for personal appearances. New Mount Airy resident Betty Lynn was filled with mixed emotions as she viewed the special pieces of wardrobe worn by her dear friend. With tears coming into her eyes, she said, "We're supposed to be happy!" and smiled. Emmett has been speaking with Francey Knotts regarding other possible donations to the Collection. He also has shared with Francey his excitement about the upcoming new Mount Airy Visitors Center that is to be located beside the Andy Griffith Playhouse and that will be the new permanent home of the Collection. According to Betty Lynn, "Francey looks forward to a visit to Mount Airy." As do all fans of Mayberry and Don Knotts. It will be wonderful to see this part of Mayberry and show business history on display with other items in Emmett's collection at the new Visitors Center when we visit Mount Airy. These new donations are just two more reasons why Mount Airy suits us so well! Here are some upcoming happenings around Mayberry. It's becoming another jam-packed year. * Now: Waitress, featuring Andy Griffith, is in limited release in theaters. * May 16: David Browning patrols the Small Business Expo in Sanford, N.C.
* May 25: It's time to rock and roll when David Browning is in town for the Salem (Va.) Avalanche game. * May 26: David Browning is off to run the bases at the Lexington (Ky.) Legends baseball game. * May 27: Jim Nabors sings "Back Home Again in Indiana" again at the Indy 500. * May 29: New Box Set release of "The Andy Griffith Show" from CBS Paramount Network Television. This release will contain all eight seasons (249 episodes), plus the show's pilot episode from "The Danny Thomas Show," and the 1986 reunion movie, Return to Mayberry. We're taking pre-orders at Weaver's Dept. Store at http://www.iMayberry.com now. * May 31: David Browning helps hand out citations at the DARE graduation in Rocky Mount, Va.
* June 1-3: James Best appears at CMT DukesFest in Nashville, Tenn. (He calls in David Browning for additional crowd control on the 3rd.) Tickets are available through Ticketmaster at (615) 255-9600. For more info, visit http://www.cootersplace.com/. * June 6: David Browning wings it at the Peninsula Pilots baseball game in Hampton, Va.
* June 8-10: Jim Nabors performs at the Mohegan Sun Casino's Cabaret Theatre in Uncasville, Conn. Tickets for the concerts are on sale now at Ticketmaster. Additional info about the venue is available at http://www.mohegansun.com/entertainment. * June 10: Orange you glad to see that David Browning is able to squeeze in a night at the Bradenton (Fla.) Juice baseball game. * June 12: David Browning lands a whopper at the Charlotte County (Fla.) Redfish baseball game. * June 15-17: Doug and Rodney Dillard float in for the Huck Finn Jubilee in Victorville, Calif. For more info, visit http://www.huckfinn.com/. * June 23: David Browning suits the Edenton (N.C.) Steamers to a tea for their baseball game. * June 26: Tentative release date for the Second Season of "Gomer Pyle, U.S.M.C." Pre-orders will begin at our Weaver's Dept. Store on June 1. * June 28: David Browning receives applause with claws at the Hickory (N.C.) Crawdads baseball game. They'll have a Mayberry Squad Car replica on hand, too. * June 29: Rut-ro! David Browning is a star at the Greenville (Tenn.) Astros baseball game. * July 1: David Browning is slowly on the move for Summer Motion Festival in Ashland, Ky.
* July 6: Heeeey, Joe! David Browning is like a cup of hot coffee at the Anderson (S.C.) Joes baseball game. * July 7: David Browning is on the run for the Aiken (S.C.) Foxhounds baseball game. * July 12: David Browning doubles your pleasure for the Elizabethton (Tenn.) Twins baseball game. * July 13: David "Hat-Trick" Browning is back in town for the Salem (Va.) Avalanche baseball game. * July 17: David Browning glides into town for the Princeton (W.V.) Devil Rays baseball game. * July 21: This new date is now confirmed for the 7th Annual Mayberry Squad Car Nationals in conjunction with the 3rd Annual Mayberry Comes to Graysville festival in Graysville, Ala. Stars and details TBA. * July 27: David Browning is fearless as he makes his whole body a weapon for the Danville (Va.) Braves baseball game. * Aug. 3: David Browning will be getting guitar sounds, banjo sounds, and who knows what all out of his jug of tricks for the Macon (Ga.) Music baseball game. * Aug. 5: Calling all Goobers! David Browning is in town for the South Georgia Peanuts baseball game. * Aug. 10: It's no cliffhanger to know who's back in town for the Salem (Va.) Avalanche baseball game. *Aug. 11: An as-yet-unnamed Mayberry event in Troy, N.C., featuring TAGS stars, and tribute artists, including David "Mayberry Deputy" Browning, Kenneth "Otis" Junkin, Jamie "Opie" Sullivan, and Jeff "Howard" Branch. Details TBA. * Aug. 15-19: David Browning camps out at the Winnebago County Fair in Winnebago, Ill.
* Aug. 21: David Browning checks the porosity of footwear at the Bristol (Va.) White Sox baseball game. * Aug. 23-25: David Browning is off to the races again at the Bristol Motor Speedway in Bristol (Tenn.). * Sept. 1-3: David Browning is looking to make arrests for a-salt and buttery at the Popcorn Festival in Casey, Ill.
* Sept. 7 and 8: There's nothing tent-ative about David Browning's appearance for an event at Tom Johnson RV in Marion, N.C.
* Sept. 27-30: 18th Annual Mayberry Days in Mount Airy, N.C. For tickets and more info, visit http://www.surryarts.org/. Stars and other details TBA this summer. * Oct. 19 and 20: Mayberry Comes to Cocoa 2 in Cocoa, Fla. This event is separate from but timed to be in conjunction with "Cruise to Mayberry 2" below. The cruise leaves from nearby Port Canaveral the day after this two-day event. The main day of the Cocoa festival is Sat., the 20th. That day opens with "A Gospel According to Mayberry" presentation at a local chapel, followed by festivities all day on Main Street in downtown Cocoa, and then a concert with the VW Boys that night. Additional activities, Mayberry stars attending and other details are TBA, but especially if you're planning on doing the cruise, you'll want to keep this event in mind for your advance planning. 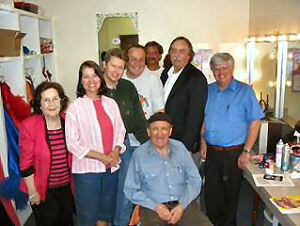 HEY STACK-Members of Mayberry chapter visit with George Lindsey backstage at the Country Tonite Theatre. Andy Griffith and his new movie, Waitress (now showing in selected theaters), both have been getting great reviews. The film has already won several awards. Opening in the looming shadow of summer blockbusters, this independent film might not be in theaters for very long, so if you see it listed at theater near you, don't wait to see it. George Lindsey just returned from a successful performance with saxophone legend Boots Randolph at the Country Tonite Theatre in Pigeon Forge, Tenn.
Betty Lynn traveled to her home state of Missouri for the Second Annual Marshfield Cherry Blossom Festival. (You may recall that she was inducted into their Walk of Fame last year.) This year she was honored with an 80th birthday luncheon that included remarks by Mayberry Missourians Mitch Jayne and Dean Webb. That same week she addressed the Missouri State Senate and visited with Governor Matt Blunt at the Governor's Mansion. 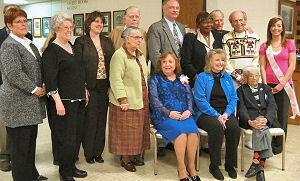 MISSOURIANS LOVES COMPANY-Betty Lynn (center with corsage) poses with other special guests at April’s Cherry Blossom Festival in Marshfield, Mo. Seated next to Betty is Karolyn Grimes, who played Zuzu Bailey, the little girl who says, “Every time a bell rings, an angel gets its wings” in It’s a Wonderful Life. Seated next to Zuzu is Mickey Carroll a Munchkin in The Wizard of Oz. Standing in the back row next to Miss Cherry Blossom Festival is Mitch Jayne and next to him is Dean Webb. Ozark weather being capricious as it is, I worried about making a trip on Friday the 13th to Marshfield, Missouri, to celebrate Betty Lynn's 80th birthday. Betty Lynn being better known as Thelma Lou, the sweet tempered girlfriend of Barney Fife on "The Andy Griffith Show." Friday the 13th didn't worry us, but the forecast gave me the fantods; heavy storms, wind and driving rain with a chance of sleet and snow, sounded like the best advice to make excuses and stay home that I'd heard lately. saw past all that to the good soul beneath, and adored him. Betty Lynn was playing herself and loved it. in town for a visit. just that up in Mount Airy I'm afraid folks will stop her on the street and talk her to death like an old neighbor. They pretty much did that in Marshfield, too, but they meant well; it's just that they gave her a big plate of lunch and birthday cake first, then paraded everybody by her to get theirs, and she never got more than a bite before somebody'd reach out of the line to shake her hand and talk, Missouri style. Dean Webb and I, the only Darling boys there (our sister Charlene only missing because of a doctor's orders), got up and said a few words about Betty, but nobody needed us to. They already knew as much about her as they needed to know about somebody from the Show Me State--she had already showed us all. Betty was just one of a few Missouri folks Marshfield had chosen to celebrate at their Cherry Blossom Festival, but she was the only true celebrity-- the shining little supporting actress for stars, who outlasted them all, to become our Thelma Lou. 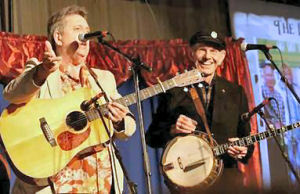 Doug and Rodney Dillard, the other two Darling boys recently returned from concert dates in Park City, Kans. and North Platte, Nebr. 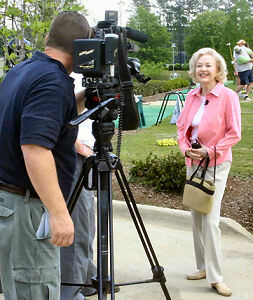 SHINING STAR--Elizabeth MacRae is radiant for a TV interview during the Eagles' Wings golf tourney. And it was a fantastic weekend with two cast members, the VW Boys and several Mayberry tribute artists for the second annual Mayberry-themed fundraiser for Eagles' Wings (a proposed facility for adults with disabilities) in Tuscaloosa, Ala. Elizabeth MacRae and Keith Thibodeaux delighted audiences. Elizabeth almost took the old show business saying of "break a leg" too literally, but proved she is truly a trouper with magical performances all weekend. We're saddened to report that Dabbs Greer, who played different characters in four episodes of TAGS, passed away on April 28 in Pasadena, Calif. He had turned 90 on April 2. Born Robert William Greer in Fairview, Mo., he took his mother's maiden name for his stage name and became one of the great character actors of his time-on stage (including many years at the revered Pasadena Playhouse), in movies and on TV. His roughly 600 episodes of TV included recurring roles on "Gunsmoke," "The Ghost and Mrs. Muir," "Little House on the Prairie" and "Picket Fences," among others. In addition to his four episodes of TAGS (as Councilman Dobbs in "Sheriff Barney," as the store clerk in "The Bed Jacket," as a quarreling husband in "Andy's Vacation," and, probably most memorably, as prospective home-buyer Harry Simms in "Barney Fife, Realtor"), he was in two episodes of "Gomer Pyle, U.S.M.C." His 50-year career in movies began in 1949 and wrapped in 1999 in The Green Mile, in which he played the aged Paul Edgecomb, a prison guard portrayed for most of the film by Tom Hanks. Dabbs Greer never married and had no survivors. But his impressive body of work will be with us for generations. And he'll have a favored place in Mayberry, especially for playing the character who almost bought Andy Taylor's house. That's all for News of Cast & Crew for this time. Here are some new and recent offerings at Weaver's. Our shelves are well-stocked with many other popular items, including some that had temporarily sold out in recent months. We offered the original 8-season set at a steep discount of just $249.00. We've knocked an additional 20% off the already-lowered price of this new edition and are offering this collection for just $192.00! While the previous 8-season box set was a great deal at $249.00, this new set, at a still lower price and with the additional features, is an even better deal. We're taking pre-orders now. The official release date is May 29. We'll ship all pre-orders by that day. We're pleased to make this All Souls Church Wooden Building Front available in larger quantities as a potential fundraiser for church groups and other civic organizations. The numbered building fronts, which had a limited-edition production of no more than 5,000 pieces, are no longer in production. The painted pieces, part of the retired Mayberry Main Street Collection, measure approx. 5 in. x 5 in. x 1 in. thick. The manufacturer's suggested retail price for each building front was $18. We sell them individually at Weaver's for $15. While they last, we're offering the All Souls Church in lots of 20 for $100. Our thought is that, at this price (below wholesale), church groups and civic organizations could re-sell the buildings for $10 to $15 each and thereby produce a pretty good fundraiser. This price might even make it feasible for Mayberry Bible Study groups to use the buildings as nice items to present to Bible Study participants who complete the course. Any which way your group uses the buildings, one thing's for sure--Mayberry is always a good place for All Souls! Nope, it's not too late. We've still got some copies of this year's official Mayberry Wall Calendar. Get one and get some good use out of it before it becomes a hard-to-find collectible. We would suggest that you get a second one and keep in the shrink wrap as a pristine collectible, but Bert Miller says that's too pushy, so we won't suggest it. That brings our total number of chapters since TAGSRWC was founded in 1979 to 1,312. WHERE'S MY PLAQUE?-An Mayberrily motley crew from Mayberry chapter hangs around their squad car in the Dogwood Arts Festival. The chapter was awarded a plaque saluting their entry as the "Most Outstanding Specialty Unit" of the parade. you. Your group can do as much or as little as you like. Or write to us also if you would like to contact a chapter near you. Our address is TAGSRWC, 9 Music Square South, PMB 146, Nashville, TN 37203-3211. Several TAGSRWC chapters from at least six states attended the Eagles' Wings fundraiser in Tuscaloosa in April. 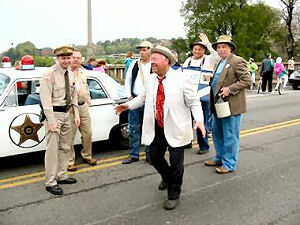 The Mayberry aspects of the event, which spanned four days, were spearheaded by TAGSRWC's local "Hearty Eatin' Men and Beautiful, Delicate Women." We had some of the most extensive answers ever for quiz entries this time. Contestants really did their homework. In the end, there were six entries with all the answers correct. We put all the entries in a hat and pulled out the winner...Dennis Marshall of Baton Rouge, La. Attaboy, Dennis! He gets his choice of any single item (that is not a box set of DVDs, grab-bag or set wooden building fronts, etc.). Old softy that she is, Miss Crump couldn't bear to let the other five entries with all correct answers go away empty handed. They all worked too hard. Stan Nicholson, for example, submitted his answers by handwritten letter. Five pages worth! He has e-mail access, but we reckon he just doesn't trust one of those machines for his quiz entries. So Miss Crump thinks Stan should get something just for penmanship alone. And we're using Dennis Beal's entry as the core of our answers below. Just for saving Miss Crump a lot of typing, he deserves something. And Joyce Johnson submitted by far the most succinct entry with all answers correct. That ought to earn her something. That just leaves Michelle Bryson and Barbara Adams, both of whom sent in extensive entries and are always attentive to their Mayberry studies. Miss Crump has decided to award each of these five any item at Weaver's that's priced at $20 or less. We would offer bigger consolation prizes, but as Miss Crump points out, "I am not a Rockefeller." (Miss Crump won't say "ain't no.") Shopping hint: Mitch Jayne's new book will be available soon. All six winners should just let Miss Crump what prize you want, and she'll alert Ben Weaver. Here are some of the possible correct answers. In most cases, there were many more. 1. Other than in the opening credits of TAGS, name four Mayberrians who have been seen throwing a rock (including a stone or a pebble) with their bare hands. * Andy Taylor threw rocks in "Barney Gets His Man," "The Bazaar" and "Andy's Rich Girlfriend"
* Peggy McMillan threw rocks with Andy on the pond in "Andy's Rich Girlfriend"
* Mr. Finney threw a rock through Mrs. Finney's window in "Howard's Main Event"
* Howard Sprague threw rocks into the sea in "Howard's New Life"
2. Not counting rocks (or stones or pebbles), name 10 objects that either Mayberrians have seen being thrown by bare hand or are reported to have been thrown by bare hand in Mayberry. NOTE: Otis didn't throw a leg of lamb at his mother-in-law; he just hit her in the mouth with it when he swung it at his wife and missed in "Ellie for Council"
* Mr. Frisbie's barn in "Aunt Bee the Crusader"
* Tate Fletcher's barn in "The Cow Thief"
* Walt Simpson's barn in "Goodbye Dolly"
* Arnold Bailey in "Opie's Most Unforgettable Character"
* Opie's unnamed pal (played by Ronnie Dapo)in "The Haunted House"
* Henry Bennett (caught the baseball and threw it back, causing Mayberry's team to lose) in "The Jinx"
NOTE: Frank Smith in "Andy's Rival" or members of the Mt. Pilot Comets in "The Ball Game" were not accepted because they are not Mayberrians. 5. Name three human Mayberrians whose first name begins with the letter "O." * Otto a Mayberry merchant mentioned in "Andy's Vacation"
* Orville Portnoy, night man at the bakery mentioned in "Aunt Bee's Crowning Glory"
NOTE: Oscar Fields (Otto Feldman) was not accepted because he was not a Mayberrian. Ditto for Uncle Ollie and Oliver Gossage, who was said to be from Raleigh. Osgood from the Osgood vs. Welch dispute was also not accepted because his first name was Ted. BONUS: Name six times the number 11 (or 11th) is mentioned in Mayberry. * Aunt Bee's jar number in "The Pickle Story"
* Aunt Bee took 11 flying lessons before soloing in "Aunt Bee's Big Moment"
* Barney gave out 11 speed warnings out on Highway 6 to el truckos in "Barney's Sidecar"
* Barney marks 11 off of calendar in "Citizen's Arrest"
* Opie is 11 years old in "A Man's Best Friend"
* Goober has worked at Wally's Station for 11 3/4 years in "Goober the Executive"
* Barney tells Mr. Jammel that he sometimes doesn't go to bed till almost 11 in "TV or Not TV"
* Barney talks about his not hitting the pillow until a quarter till 11 in "The Lucky Letter"
* Gilly Walker tells Goober that he promised his car would be fixed by 11 in "Goober Takes a Car Apart"
* An 11-year-old boy is mentioned in Help Wanted ad placed in paper by Andy in "Opie's Job"
* There are two mentions of 11 as Andy and Barney play dominoes "High Noon in Mayberry"
* Andy mentions the time as being almost 11 in "Ernest T. Bass Joins the Army"
* Goober has worked at Wally's for 11 and ¾ years in "Goober the Executive"
* Warren mentions that it's 11 o'clock in "Wyatt Earp Rides Again"
* Opie mentions having supper at 11 o'clock in "Opie Steps up in Class"
* Floyd mentions 11:30 in "The Ball Game"
* There were 11 supermarket robberies in Raleigh mentioned in "A Visit to Barney Fife"
* Bobby Gribble wrote that he hated Emma Larch in the sidewalk 11 years ago in "The Case of the Punch in the Nose"
After that extensive quiz last time, Miss Crump has just one question and the Bonus this time. But that doesn't necessarily mean this quiz is going to be all that easy. 1. Identify four different animals seen in Mayberry that Mayberrians either appear to believe can speak English or else mistakenly believe are actually human. BONUS: Identify a specific instance that the name Tommy Bradley occurs in Mayberry. The person whose quiz has the most correct answers will receive his or her choice of any single item offered online at Weaver's. (Neither a boxed set of TAGS DVDs nor a set of Wooden Mayberry Building Fronts is considered a single item.) If there is more than one person with the most correct answers (as is usually the case), we'll draw a winner from all the top entries. Submit your answers to OldLadyCrump@iMayberry.com or, Stan, mail them to TAGSRWC, 9 Music Square South, PMB 146, Nashville TN 37203-3211. All entries must be e-mailed or postmarked by June 15, 2007. Have fun and good luck! The next issue of The eBullet is scheduled for early July, with a Weaver's Newsletter planned for June.